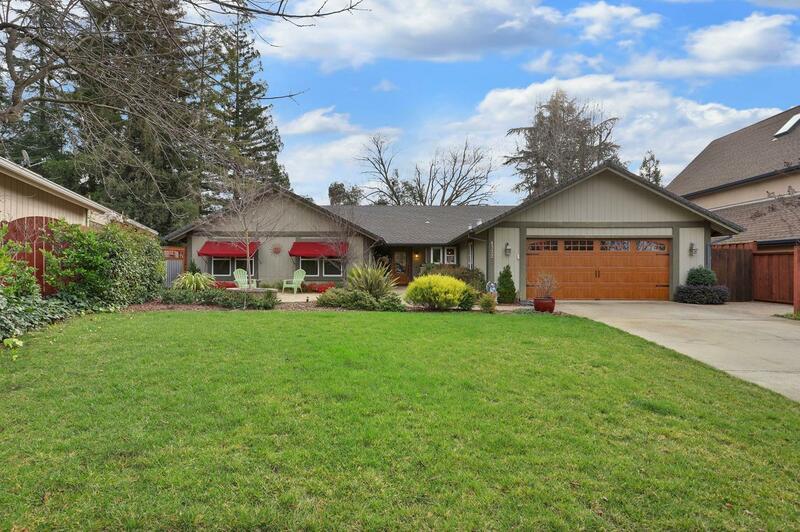 Fresh landscaping, a new garage door and a beautiful mahogany front door welcomes you into this updated Fair Oaks home located near hiking/bike trails and the American River. Once inside you'll find great natural light throughout, hardwood floors and a desired floorplan. The formal living/dining areas are spacious and bright while the open great room concept kitchen/family/dining nook are highlighted by a stunning vaulted wood ceiling and warm brick fireplace. The kitchen itself boasts granite counters, a gas cooktop, recessed lighting and island. Large master bedroom with outside access and walk-in closet. Spacious guest bedrooms, updated double sink vanities and tile in both bathrooms plus a whole house fan and laundry room with abundant storage complete the interior. In the private backyard, you'll enjoy the covered and open patios and raised planters. This house feels like home!